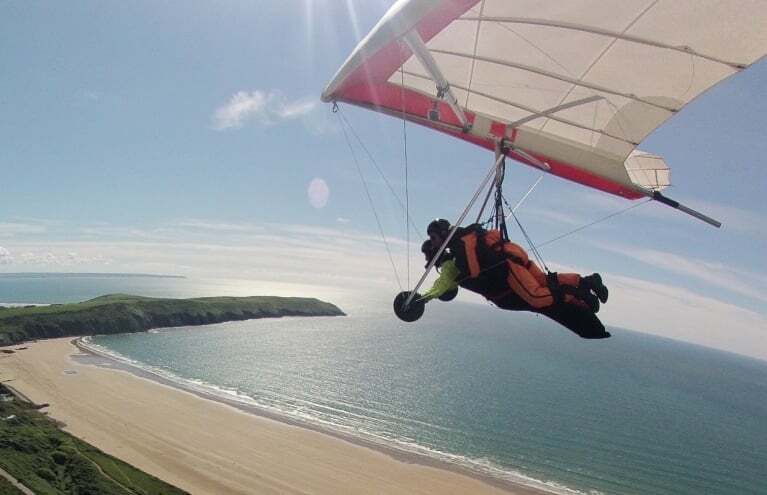 Enjoy experiencing one of the best air activities around with an incredible hang gliding experience day! Hang gliding truly is a mind-blowing activity: slower-paced than other aerial thrills like skydiving or aerobatic flying, hang gliding is no less thrilling; you will have time to appreciate the breathtaking views that unfold beneath you as you fly. Tandem hang gliding will bring you the comfort of an instructor right beside you - so you can focus on admiring the views and having the time of your life! The perfect experience gift for a daredevil or an awesome activity to give you a real sense of peace and exhilaration. Treat a loved one to an amazing flying gift experience with these awesome hang gliding activities. If you're based further up north, you can't go wrong with a Hang Gliding Experience in Derbyshire, where you can take to the skies with an instructor and enjoy a magnificent flying activity with very little effort on your part! Sit back and enjoy the ride as your qualified guide takes you on an incredible aerial journey at 3,000 feet over the beautiful Derbyshire countryside. Appreciate the awe-inspiring views as you enjoy a once-in-a-lifetime perspective of the world. What happens if my Hang Gliding experience is cancelled due to weather? The weather massively dictates Hang Gliding unfortunately. If the weather isn't right, you may have to reschedule your experience - so it's best to check with the centre before setting off on the day.